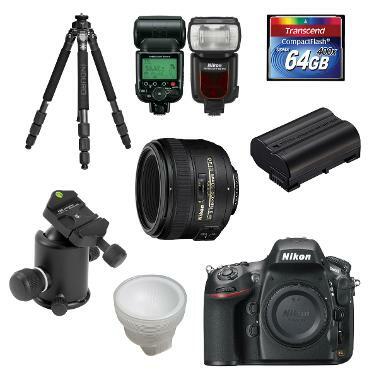 Enjoy one of Nikon's best high-resolution cameras along with one of Nikon's fastest and sharpest portraits lenses that works very well with natural and low light. The flash is powerful and produces flattering, soft light with the dome diffuser. A large memory card ensures that you can shoot all day without missing a moment, as does the extra battery. When you want to interact with your subject, a tripod and quick-release tripod head is there to support you. Get rich, sharp, and colorful portraits with this setup.